This 1" UL approved automatic shut-off, fuel dispensing nozzle is compatible with most fuel hoses commonly found on diesel dispensing machines. The no pressure, no flow design prevents fuel spills, while also restricting flow from starting until system is pressurized. 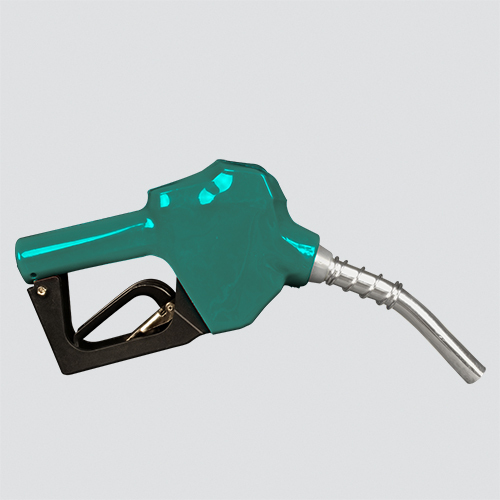 The green vinyl covered handle provides product identification and a comfortable hand insulator. High impact lever guard will not scratch vehicles. Notes: Nozzle designed for pump driven fuel systems with a minimum of 15 PSI and a maximum of 43 PSI. A minimum of 15 PSI is required to operate the nozzle. Do not use on gravity flow systems. Improper use may cause a hazardous condition. Avoid static hazard. In case of fire do not remove nozzle. No smoking/extinguish all flames. Licensed drivers only. Do not top off. Refer to posted warnings.